Today I am 38 week's and 2 day's pregnant and I now only have less than one week of pregnancy left. It feels so strange knowing that in a few days time I will have my baby and that I won't be going overdue this time around. 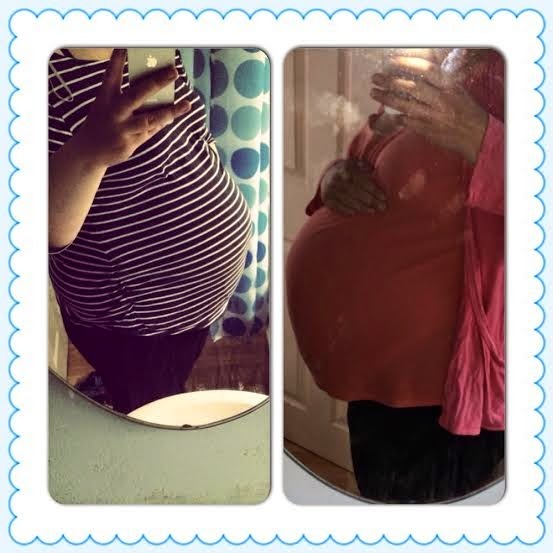 I am starting to get very nervous about the birth now, I am not sure why as I have been lucky and had two normal straightforward easy birth's with the girls and I have also been induced before in my first pregnancy so I know what to expect. I guess it is just last minute nerves and the fact I am a born worrier in life, I just hope everything goes o.k and everything is o.k with the baby. Bump has grown a lot in a few weeks! When I was exactly 37 week's I had my last midwife appointment before the baby is born and my urine and blood pressure were normal. I got to hear baby's heartbeat and everything seemed perfect with him. My bump was measured and is now measuring 39 weeks, so its two weeks ahead now - maybe he is not such a small baby after all. But the baby has not engaged yet and is still quite high above my pelvis, which is normal when you have had a baby before. I have really struggled with pregnancy this week I have been suffering from lots of cramps and Braxton Hicks which are uncomfortable rather than painful. I have also started to get lower back ache and my hips and legs have been achy too, I have been getting lots of cramps in my legs and feet. Getting comfortable in bed is a nightmare and I even find it painful and a struggle to roll over in bed now. I have not been sleeping well due to the fact I cannot get comfortable and I am constantly needing a wee during the night, so I feel so tired all the time and have no energy at all at the moment. I have also started to get mild heartburn the last few days but luckily yoghurts and milkshakes seem to help. And I seem to go through stages of either being so hungry and eating loads to having no appetite and hardly eating at all some days. My bump feels so big this week I am sure it has doubled in size recently, I just feel like I am going to pop and even my maternity tops are not covering my tummy now. Baby is still really active but his kicks are starting to hurt now especially if he rolls from side to side. My bump has also been feeling really heavy. I have eventually got sorted for baby's arrival, at last, the hospital bag's are packed and ready to go I just need to buy some drinks and snacks to add to them. And we have most of the baby's things now we just need to get a few small things like extra wipes and tins of milk in for him. I have reached the stage of pregnancy where I want to nest but I am finding it impossible as I have Sophia all day and I cannot get any housework done with her about and the other half leaves the house for work at 7am and returns home at 7pm. I just want the house all nice and clean and tidy and cleared out so I can bring baby home to a nice house. At the moment the house really is just a mess and is in desperate need of a good clear out and it is really getting to me, the things we mums worry about. I have also been feeling a bit emotional at times and have cried for no reason recently, damn hormones! I have also realised that I am wanting to go out less and less as I just get uncomfortable when I am out. I feel so bad for the girls though being stuck at home all the time when I should be taking them on nice days out. And I also feel really bad that Chloe is having to help me with Sophia sometimes when she should not have to, she is still a child herself. Anyway's that is all that has been happening this week I cannot believe that the next pregnancy post I write will be my very last one! Ohh exciting times!!! Good luck! !